An explosion of fruit in every sip, Dragons & YumYums is an intensely tropical - yet subtlety bitter - pale ale brewed with a combination of dragon fruit, yumberry, passionfruit, pear juice and black carrot juice. Clocking in at 6.5% ABV and 25 IBU, Dragons & YumYums is a first-of-its-kind collaboration with American rock icons, The Flaming Lips. A sensory enveloping experience at the intersection of creative beer paired with creative music, the energy of this union inspired Flaming Lips front man Wayne Coyne to use ingredients from the beer - dragon fruit and yumberries - as characters in two original songs, The Story of Yum Yum and Dragon and Pouring Beer in Your Ear … making this the first beer with its own theme song! 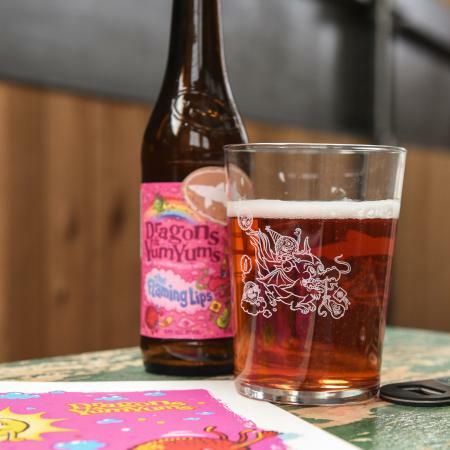 The psychedelic influence of the label artwork, designed by Michael Hacker as part of Dogfish Head’s Off-Centered Art Series, was influenced by the legacy of the Flaming Lips and the culinary components in Dragons & YumYums shown through radiating lines, movement of fire, dancing lips, rainbows and bold pink colors.